Washington D.C., Tallahassee and Palm Beach County—the Cultural Council advocates for the arts at all levels of government. Considered globally as an economic driver, the cultural sector attracts talent and investment, builds international reputation and catalyzes innovation across all sectors of the economy. The Division of Cultural Affairs is advancing a recommendation to fund $62 million ($61,660,924) in the General Program Support matching grant program to 666 organizations from across the state. There are 52 PBC-based organizations vying for $6.3 million ($6,347,740), just over 10% in four areas: Cultural Endowment, Cultural Facilities, General Program Support and Specific Project Support. The Cultural Council of Palm Beach County recommends full funding of all projects. Holding Palm Beach County Day at the beginning of the legislative session is an excellent opportunity to keep Palm Beach County’s legislative priorities in front of lawmakers all session long. 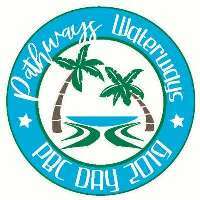 Palm Beach County Day 2019 takes place on March 5-6, 2019 in Tallahassee. We hope you will continue to make this event a priority as we all work for the greater good of the residents of Palm Beach County. State: The Division of Cultural Affairs is advancing a recommendation to fund $62 million ($61,660,924) in the General Program Support matching grant program to 666 organizations from across the state. 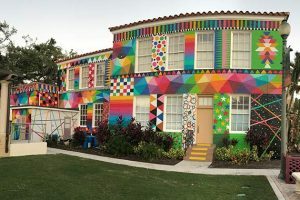 There are 52 PBC-based organizations vying for $6.3 million ($6,347,740), just over 10% in four areas: Cultural Endowment, Cultural Facilities, General Program Support and Specific Project Support. The Cultural Council (and Cultural Coalition) recommends full funding of all projects. Local: The Cultural Council is advocating for $100,000 in additional funding for the C1 grant program in an effort to restore funding to $400,000 level (currently $250,000). There can be no doubt that arts education has a significant impact on a student’s life in Palm Beach County. From their first drawing in art class to their final bow in a play, each student’s success both in and out of school is affected by their involvement with the arts. 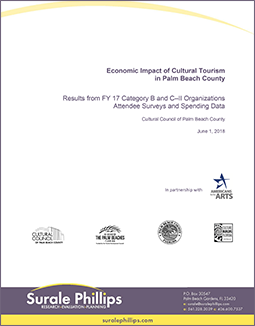 The information on this pamphlet comes from the 2018 Palm Beach County Arts and Cultural Education study, conducted by Surale Phillips of Decision Support Partners and commissioned by the Cultural Council of Palm Beach County. Forty-seven Palm Beach County nonprofit cultural organizations were included in the survey that collected PreK-12 education activities during the 2016-2017 school year. Arts-friendly policies and funding need consistent support and the Council fights on the front lines to educate elected officials on the economic and quality-of-life benefits of the arts. The Council can’t tackle these issues alone. Advocacy earns results by participation and strong voices from constituents. That’s you! It takes two minutes to contact your representative with the simple facts stated here. Please use the links below to do just that. The purpose of the Palm Beach County Cultural Advocacy Alliance is to gather together the leaders of cultural organizations and the creative sector in Palm Beach County, with purpose, to discuss and act upon issues, projects, campaigns and initiatives of mutual benefit to the respective cultural organizations and to the people who live in and visit Palm Beach County. This committee is an extension of the Cultural Council’s advocacy work – an integral part of a local arts service agency’s mission – and also includes Council board members and representatives from other advocacy partners from around the county. This collaborative work will ensure that the arts and culture sector is relevant to the community, its leaders and its citizens, a fact that will be evident because culture will be included in long range plans, funding plans, and important community decisions.